“Globalization and digitization have improved the reach of supply chain operators, granting access to customers and suppliers anywhere in the world. Unfortunately, the increased length and complexity of supply chains has also increased the risk attached to the business of supply and demand. Fortunately, big data and advanced analytics make it possible for supply chain professionals to monitor natural and man-made events. Unfortunately, event monitoring without the proper technology to make sense of the data and analytics is time-consuming and by itself is insufficient to properly manage supply chain risk. Unlike some traditional “fortunately-unfortunately” stories, this one has a happy ending, but what is R Score exactly, and how does it really measure up as a supply chain risk management KPI? R Score is a proprietary metric, based on data provided by Resilinc’s deep supply chain mapping and intelligence platform. Although you can get your own company’s R Score for free (if it’s one of the companies already assessed), access to broader intelligence and customized analysis requires an engagement with Resilinc, platforming order to index your company on the platform. Use your R Score as leverage during customer/supplier contract and price negotiations. Perhaps more to the point though, your company’s ability to monitor resiliency against a set of predefined, universal standards is a huge step toward best-in-class supply chain risk management. By integrating all these elements into a single standardized value, R Score is influencing the continued evolution of supply chain risk management, aiding transition from a subjectively measured discipline into one where big data enables performance to be base-lined, benchmarked, and (through the adoption of best practices) enhanced. What Does an R Score Look Like? From my perspective as an independent, but interested observer, R-Score wins as a supply chain resiliency metric for two reasons. The first is the depth and breadth of intelligence behind the numbers. 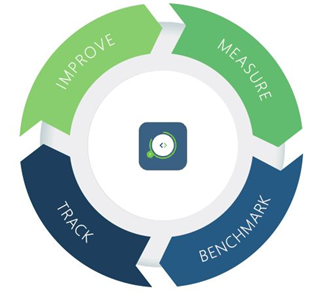 The second is because despite the complex analysis involved, R Score successfully combines three attributes that make a benchmark or KPI usable—simplicity, detail, and context. These attributes should position R Score as the go-to metric for tracking supply chain resiliency. And, as it surely gains adoption, the quantity and quality of available data will only increase, “fortunately” creating more fruitful discussions about supply chain risk management for buyers and suppliers now and into the future. Simon Lucas is a supply chain management professional with some 20-year’s practical experience in domestic and global logistics. Perplexed by a lack of quality content online, Simon began writing for the industry in 2012. This became his second career, and very soon, his first. Simon now writes full-time, crafting content to help businesses boost their supply chain management and logistics capabilities.